My fiancé, Roman, and I are both professional photographers. He is a commercial fashion photographer while my focus is on lifestyle and wedding portraits. When Roman decided he wanted to propose to me, he came up with the most unusual and unique way to capture the moment. 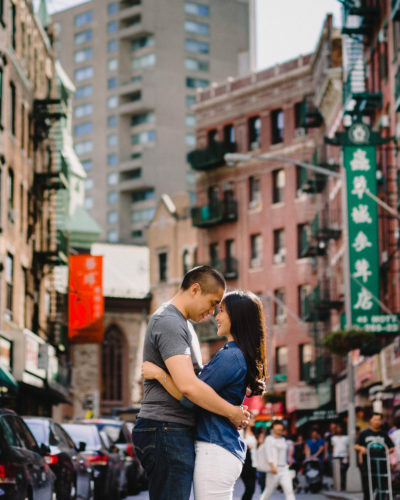 This is the story of how I photographed my own surprise proposal. In late July, Roman asked me where we should celebrate our four year anniversary. Our anniversary is in November but since I have to shoot a wedding on that date, he suggested that we take a trip in September during New York Fashion Week; his ‘downtime’. I am not one to turn down trips of any kind with him so obviously, I said, “YES! Where should we go? !” We threw some places we wanted to visit in a hat and picked Greece as our destination. I’d never been to Greece before, but the blue waters and white caves were already calling to me. We would travel from Athens to Santorini, to Mykonos, and back to Athens. I was especially excited about Santorini! For those of you who do not know Roman, he is the type that jokes around, A LOT. There have been times (on past trips) when I would ask him, “Are you going to propose?” and he would answer “No.” but would get down on one knee to tie his shoe. This time he said, “Yes.” Since I had been fooled by him before, I laughed it off. He then gets down on one knee, and at this moment I am still laughing because I think he is about to tie his shoe again. Then he pulls out a ring from his pocket, and I completely froze. In complete shock, I asked, “What are you DOING? !” and repeatedly punch him in the arm. The 11-second self-timer goes off right at the moment when he pulls out the ring and my mouth is wide open. Of course I said, “Yes!” and it was all smiles the remainder of the trip! And that is how I captured my own surprise proposal in Greece. Please enjoy some photos of our trip below!